I went to dialysis on Friday with so many questions in my mind. I was in such deep thought, I don’t even recall how I got to the dialysis center. All I remember was I pulling up in the driveway and heard somehow honk. I looked up and it was one of the patients waving hello. Allow me to clarify a little, individually the employees are great. I can honestly say if I meant them in another place and in another time, I would consider them friends. It’s just from what I observe “some” not all really have grown desensitized to their job. I understand a lot of them have been doing this for a while. It can get boring or repetitious, however, the patients don’t see it that way. Patients like myself see it as “you”don’t give a crap about me. I see it as you already see me as a hopeless case just waiting for my time to be called. What happen to being sensitive and compassionate? I mean really you are dealing with people who have a disease that does not have a cure “JUST YET”. How exactly are these patients suppose to be? Most of the patients are elderly and those who aren’t probably have a lot on their mind. Isn’t the job of the team at the center to reassure and encourage? For example, there is a social worker at my center. I believe I’ve only spoken to her twice. I’ve been there for nine months. Per Wikepedia a “Social Worker” is is a professional and academic discipline committed to the pursuit of social welfare, social change and social justice. The field works towards research and practice to improve the quality of life and to the development of the potential of each individual, group and community of a society. Social workers perform interventions through research, policy, community organizing, direct practice and teaching. Research is often focused on areas such as human development, social policy, public administration, program evaluation and international and community development. Social workers are organized into local, national, continental and international professional bodies. Social work, an interdisciplinary field, includes theories from economics, education, sociology, medicine, philosophy, politics, psychology, and as well as anti-oppressive and anti-racist discourse. Okay, going by the definition she does none of that. She hasn’t asked me if I needed anything or how am I feeling. I mean when she does see me, she can’t even wave “hello”. I’m not targeting her or saying she is bad but she is a social worker. It’s her job to see if the patients are well especially the new ones. There is so much emotional and mental acrobatics that you experience as a kidney patient that support from your social worker is vital. Thankfully, I have a strong family! Anyway, what is the whole point of my rant? The point is things need to change. People need to be aware especially those who work with kidney patients. We have enough things going on in our daily lives. For those of you who work at dialysis center, you guys get to go home and leave your job for a few hours. WE patients live with this daily, minute by minute, hourly, and yearly. We expect since you all are the professionals, you should have our best interest in mind. I know that you can’t baby us, that’s not what I’m saying.What I am saying is we could easily be someone in your family or a friend. Treat us like we matter.. Thanx!! You are right on target here. 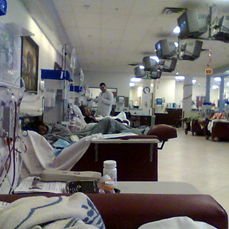 I’ve been on dialysis since Feb. 2010. Remember all the rollercoaster riding, emotional swings, but I remember adjusting pretty good except for having the catheter and fistula for most of that time. My fistula continually was infiltrated and it would have to “rest” for weeks. The establishing of “buttonholes” was done by 4 people alternating when one person is supposed to do the buttonhole. So now mine is wide on the inside. I have the same feelings about the staff at my center. They were encouraging to me most of the time, but I watched how others were treated, and it broke my heart. They were competitive with each other and for what reason, I can’t understand. Their job is such a wonderful committment to helping all of us on dialysis and that is a higher calling. I respect them so much for all the hours they are on their feet, sometimes working for 15/16 hours a day, 6 days a week. You gotta admire that. Maybe you are correct in your assessment of their attiude becoming complacent and the job just a means of a check. Most are not like that, but I’ve seen the same thing in others. You are a lovely woman and have a very supportive family as I do. And You and I are the apple of God’s eye. My faith has brought me to being content with my disease, and I am glad dialysis is available for us and ESRD isn’t an automatic death sentence anymore. Thank God for that. Actually, only sincel 1980 could women even have dialysis! By the way, I am 68 and very happy to meet you.